I bought the original Readers Digest "Complete Do-It-Yourself Manual" 30 years ago and it's the best general coverage book I've ever seen. 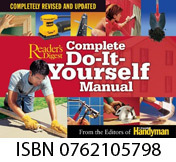 I now own the revised edition--the Readers Digest "NEW Complete Do-It-Yourself Manual" published in the early 1990's. No book that covers all topics can have sufficiently detailed instructions for every project, but when I have a home repair question, this book has useful information 50-60% of the time. I've never had another book that came close to this hit rate. The latest edition [ISBN 0762105798] a slick/shiny red, white & blue oblong hardback that sells for about $25. I don't own this version but if it stands up to it's predecessors it a book to own. If I have one criticism of the book it's that it doesn't give any idea of the difficulty. That is, how do-it-yourself friendly a repair is. But, when I find the "perfect" book I'll let you know. DO NOT confuse this book with the Reader Digest "Fix-It-Yourself Manual". The Complete Do-It-Yourself Manual was so good I bought the sequel. Mistake! I must have picked it up looking for help 50 or so times over the years, and only found it useful once or twice. I no longer pick it up at all. You can often find this book at Walmart or Sam's type places. Note: Most people who have links to sites like Amazon or Buy.com get referral fees if you buy the book after using their link. I don't. Please CLICK HERE to see why, and how you can help this website (this is not a request for money). It's an excellent book. I've used it for a couple of tiling jobs. Easy enough for beginners, yet covers every aspect of setting tile. I've never seen these books myself but, I've seen them highly touted on TV home repair shows as a good books for the newbie -- How to Enjoy Interior Housepainting by Richard Boesser ISBN 0962265152. I've seen the following book highly recommended. If you get any of these painting books please write and tell me what you thought of them, good or bad.